Hi I’m Zara, one of the team of dedicated stylists at Helen Gee Hairdressing and this is my first blog . I hope you enjoy it. This was such an amazing event to attend, I am glad that I made the effort to go. Reading the description for this, confirmed my enthusiasm to attend the event, Sam McKnight, Josh Wood and George Northwood all talking in the tutorial. In the hairdressing world these are three big names in the business. Sam McKnight, described as the original session stylist with a career spanning over almost 40 years. Josh Wood, global creative director of colour for Wella Professionals. George Northwood, is a name in high demand from celebrities and beauty editors. The man behind the Alexa Chung ‘it’ bob cut. It was a bright and early start on Sunday 22nd May and the Hair Heroes Super-Tutorial was the first of the day at 10am. The sun was shinning and London was looking beautiful. When I made it into the Vogue World marquee, to the tutorial room, I was unsure of what scale it would be on. It turned out to be a small, intimate space, with everyone taking their seats. I suddenly realised how few of us there would be, probably less than a hundred people. First to take his seat was Sam McKnight, well know for session styling, he told us “I’ve probably done over 80 covers for British Vogue”. His time was spent going through photographs/covers from vogue issues and telling us the story behind them. It was lovely listening to his knowledge in dressing hair and the experience you gain by having to ‘wing it’ when the kit bags don’t make it to the shoot. That today the industry moves at a much faster pace. How its gone from supermodels to celebrities on the covers of magazines. Then came George Northwood. When entering tickets were given to anyone interested in having their hair cut live on stage. The ticket was drawn and the girl made her way to the stage. George talked about the looks he likes to create being effortless and to look slightly underdone. Textured but with a blunt edge which is very of the moment and the art of tonging to achieve this look. The model was given the ‘Alexa Cut’ in which he used his unique invisible layering technique. It was very inspiring watching him work quickly to achieve a strong look on the girl. 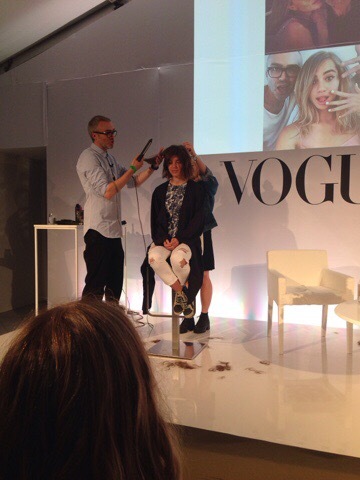 And finally Josh Wood came to the stage, with us being a Wella salon I was keen to hear him talk. Plus knowing that Helen had previously worked with him whilst she was in London. They began with him looking through colour that he had created for the catwalks and how he works with the fashion designers, from the past to the present. He was a brilliant story teller which made it really easy to listen, talking about how colour in the hair industry has changed massively from when he first set out. Going from the main focus being purely about the cut, to now colour being on the same level of importance as the cut. 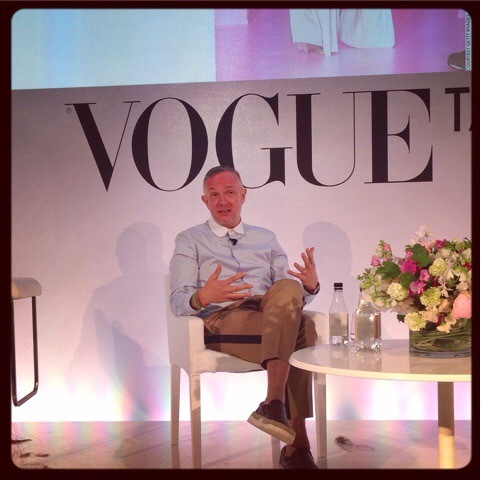 Overall, the whole trip to the Vogue Festival was a fabulous experience, listening to where they take their inspiration from for the work they do. 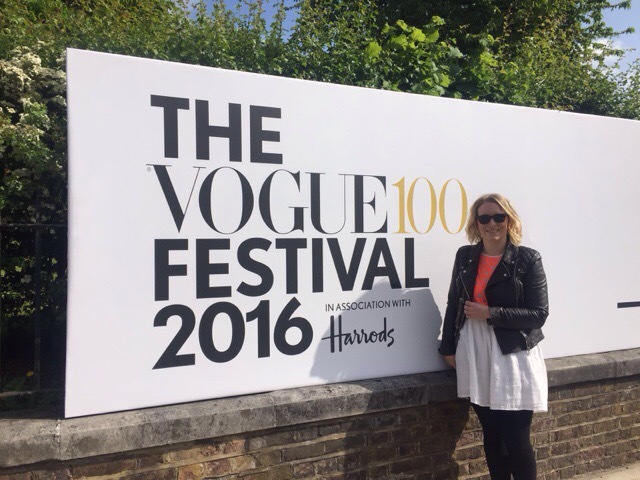 Then after being able to browse around the World Vogue Marquee for the afternoon, having my nails done to having a complimentary hand and arm massage from the Jo Malone stall. All afternoon there were free mini talks on make up/fashion trends coming up for next season. It was wonderful spending the day basically ‘people watching’, their clothes, how they had their hair to the shoes they were wearing. It only fuelled my enthusiasm, for thinking outside the box and keeping everything current, not being scared to encourage clients to try something new.